DC Bike Ride is the region’s only car-free, closed-road bike event and celebration of life on two wheels. We invite you to join the ride on Saturday, May 19, 2018 for a fun, recreational, family-friendly bicycle adventure. Early Bird Registration ends tonight, Wednesday, February 28 at Midnight! Register now at www.dcbikeride.com/pop. DC Bike Ride celebrates bicycling as a form of healthy living, fitness, transportation and fun. The event raises support for the Washington Area Bicyclist Association’s work on Vision Zero, a campaign to make streets safer for *all* roadway users. DCBR has given more than $72,000 in two-years to WABA for street safety neighborhood programs. You can save $10 per standard registration if you register today before the price increases on March 1. Kids ages 3 to 7 are always FREE and youth ages 8 to 17 are always half-price. Watch our 2018 video to learn more about the event at www.dcbikeride.com/video. Participants will receive access to the closed-road course that starts in West Potomac Park overlooking the Potomac River and the Washington Monument. The 20-mile ride will feature on-course entertainment, music and rest stops, as well as a short-cut to the finish that offers a 7-mile course (in case you get tired). The ride ends with a Finish Festival party with beats, eats and activities for all-ages at the National Mall in front of the U.S. Capitol. Participants also get a DCBR 2018 water bottle. No bike? No problem! We partner with Bike and Roll DC to bring you easy bike rentals. 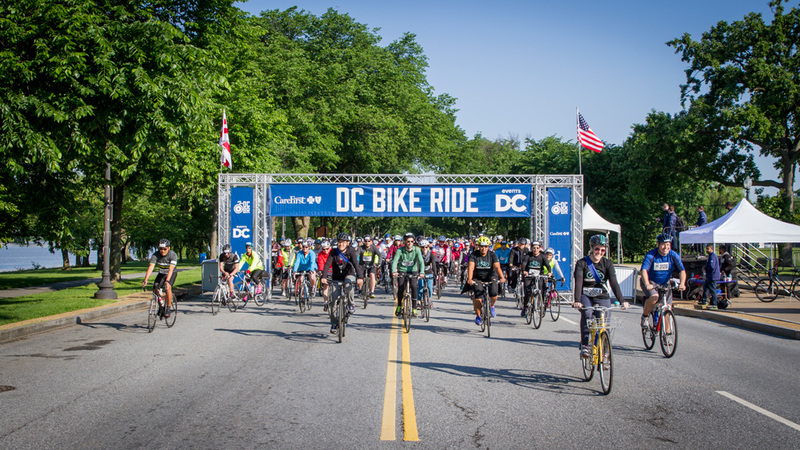 Find us on social: @dcbikeride on Facebook, Twitter and Instagram. Make DC Bike Ride your favorite springtime activity!